Robert Griffin III took the snap and headed towards the left side of the field. His bright yellow jersey flashed past the defensive end and with a burst of speed he took the corner and headed into the endzone for a score. At about the five yard line he high-stepped as he outran the final defender to score the TD. The crowd went crazy. Fans were looking at each other as if to say "did that just happen?". That is why Redskins fans are excited about this upcoming season. In drills RG3 was inaccurate at times, made some wobbly throws, and was sacked by the defense. But that one run around the corner is why the Redskins drafted the Heisman Trophy winner and it has the fans hope at an all time high level. As RG3 ran back towards the huddle following the play, he pegged the ball across the field at Raheem Morris, the Skins new defensive backs coach. The bullet hit the crossbar right above Raheem's head where he stood under the field goal posts and fell at his feet. Raheem smiled and the fans immediately let the coach have it. "Hey Raheem. Come on man! You got anyone out here who can stick with RG3?" "Nope" was all Morris could say as he shook his head. On the very next play, Griffin took the ball and hit the same corner, scoring a second consecutive touchdown. 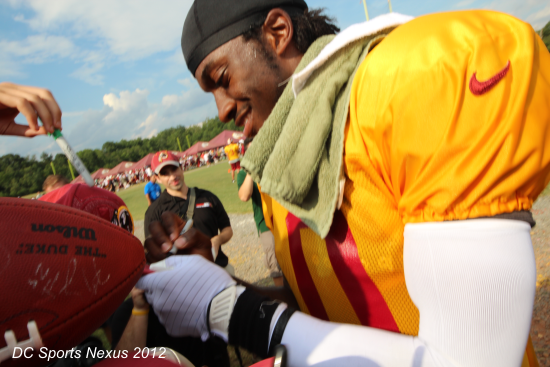 The fans pleaded with RG3 to throw another rocket towards Raheem Morris, but RG3 thought about it, and opted to let the fans take care of Morris for him. "Hey Coach, you better find some new players. Nobody can stick RG3!" Morris just had a big smile on his face, he had nothing to say. He knows the truth. If his guys aren't going to stop RG3 when they know the offense, how are opposing defensive coaches going to be able to gameplan for the rookie. 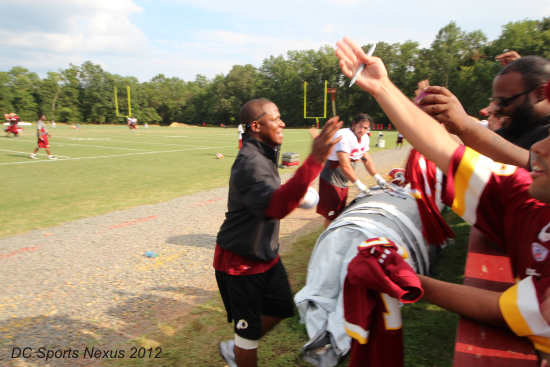 When practice ended, Coach Morris came over to talk to some of the heckling fans. On his way over he gave RG3 an NFL calliber hit, bigger than anyone out on the practice field has given the rookie on this young season. He didn't knock over RG3, but he gave him quite a blow that loudly popped the quarterback's shoulder pads. Both guys were all smiles, but neither had a bigger smile than any fan in the crowd. 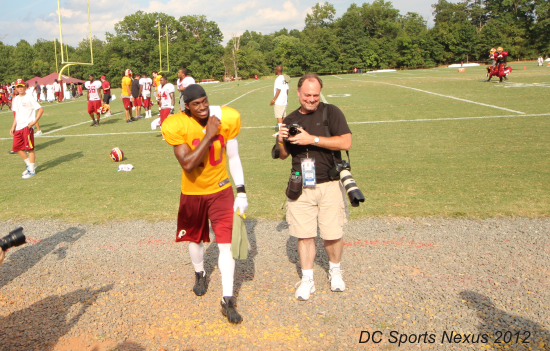 They are just excited to have RG3 out there on the practice field instead of Rex, Beck, or anyone else. "When you get him, you get him"